Yeeeee Haw! It’s Monster Truck Thunder! The stands were packed with curious and cheering fans Saturday at the Linn County Oregon Fair and Expo Center, all gathered to witness the Monster Truck Thunder Winternationals spectacle — a sort of traveling carnival of motorhead glory, bringing the mechanical beasts up close and personal to the crowd. Seven monster trucks stood in a line, idling with a guttural rumble that sent ripples through the carbon monoxide-thick air. The arena was so thick with the stuff that event organizers shouted over the engines’ roar, telling building operations personnel they had to turn on the vents. “Racers live for that smell!” shouted Charissa Wheeler of Salem, who came out to the event to watch some friends run the quad contest – a high-octane side show that lets local novice riders speed rings around the dirt track, spitting dirt and smoke into the air. “Those are four women!” shouted Doug Hodge, down from Dallas to watch his daughter, 19-year-old Cassidy Hodge, ride her quad. He was pointing to a neat row of quads, gearing up to run the course. But the real draw are the monsters, which spin donuts in the dirt and bounce into the air, boggling the mind with the amount of kinetic energy that explodes from the machines as they perform. And it’s loud. Really loud. So much so that toddlers and young kids sit in the stands wearing hearing protection meant for use on shooting ranges. And what are these Monster Trucks? Since 1981, these highly modified pickup trucks have dazzled audiences. The bodies are made of fiberglass on giant suspension systems with 66-inch tires. They can be up to 12 feet tall and 12-feet wide. of course, there is a danger involved, and that’s part of the draw. 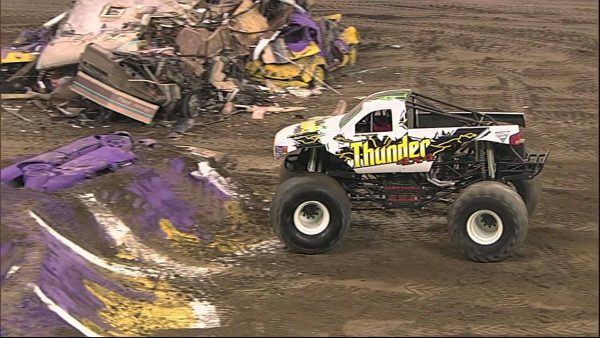 The sport made national news last month when celebrity truck Grave Digger flipped and landed on its roof in Tampa, Fla., sending its creator, Dennis Anderson, to the hospital. Maybe with that incident in mind, event organizer Ron Woodbridge paced in front of the bleachers, shooing any stragglers away from the edge of the arena, while the trucks roared, spun, and threatened to jump the rail. And while the loudness, the acrid smell of exhaust, and the sight of airborne trucks set the tone, the announcer as well maintained an unrivaled level of intensity. He screamed every announcement, whipping up the crowd to stand and cheer. But maybe at the beginning of the event, during the Star Spangled Banner, were the fans and the event best defined. The sound cut out in the middle of the song, silencing the girl who was singing. When that happened, the crowd picked up the slack, finishing the song for her. They shouted the lyrics, belted them out, and sometimes sang them, but they didn’t miss a word. An event staffer on the field kept his own time and cadence with his own rendition, and a pack of riders stood atop a tire on a dirt hill, singing it as well. It was the most discordant, off key, and haphazard version of our National Anthem, which made it beautiful as well.